If you ask most people what big event occurs in Washington, DC, every four years, they’ll probably say the presidential inaugural. For astronomers, though, the answer is the return of the American Astronomical Society (AAS) winter meeting — the “Super Bowl of Astronomy” — to the nation’s capital. The 223rd AAS meeting, held 5-9 January 2014, was our first at the Gaylord National Resort and Convention Center in National Harbor, Maryland. 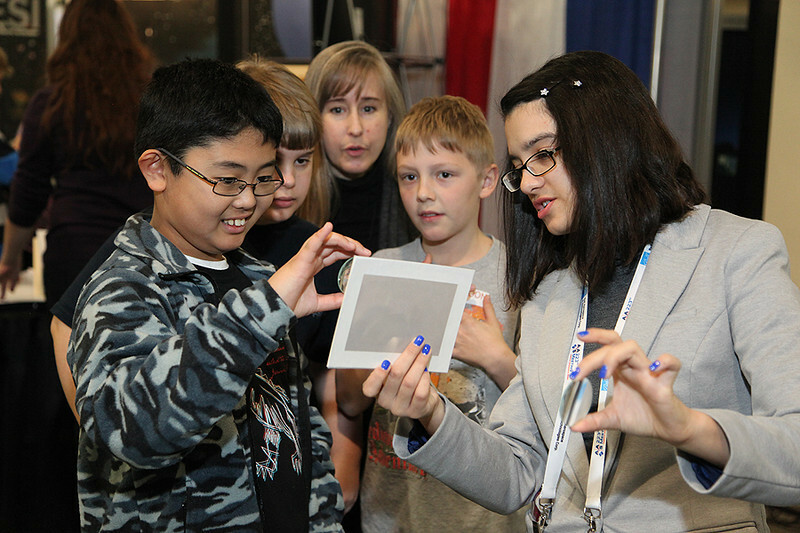 The final tally of attendees was 3,117, not counting some 150 local middle- and high-school students who dropped by one afternoon to tour the exhibit hall and participate in hands-on science-education activities. This was a joint meeting of the AAS and its High Energy Astrophysics Division (HEAD) and Historical Astronomy Division (HAD). Befitting such a large meeting, the program was jam-packed. The HAD meeting kicked off on Sunday afternoon with two sessions: “Why Is There Something Rather than Nothing in the Universe?” and “From Barnard’s Star to the Kepler Mission: Searching for Low Mass Companions to Stars.” Regular AAS science sessions got under way on Monday morning with the Kavli lecture by Robert Williams (Space Telescope Science Institute) on the legacy of the Hubble Deep Field, the iconic “baby picture” of our universe. That was just the first of a stellar lineup of some 20 plenary talks by AAS prize winners and other distinguished astronomers lasting through late Thursday afternoon, when James Lemen (Lockheed Martin Corp.) accepted the Lancelot Berkeley Prize for meritorious research and shared some of the amazing images and videos coming from NASA’s Solar Dynamics Observatory. HEAD convened two special sessions on Monday — “News from the Galactic Center” and “Consistent Cluster Cosmology.” Dozens more special sessions occurred throughout the week, focusing on topics as diverse as education, the demographics of the profession, how to handle “big data,” present and future sky surveys, next-generation space-astronomy missions, and key problems in understanding planetary systems, stars, galaxies, and the structure and evolution of the universe itself. As is always the case when the AAS meets in the U.S. political center of gravity, we gave special emphasis to public policy. In addition to numerous policy-related Town Hall sessions, where AAS members could discuss federal science policy with representatives of NASA and other funding agencies, attendees heard a special plenary address from Fleming Crim, of the National Science Foundation’s Directorate for Mathematical & Physical Sciences, which funds most ground-based astronomy in the US. In addition to all that, the 223rd AAS meeting featured more than 1,000 research contributed oral and poster presentations, about 150 dissertation talks from new PhD’s, a wide assortment of history and education papers, as well as contributed oral and poster papers to accompany the HEAD and HAD special sessions. Another highlight was the first-ever open-mic night for members to entertain friends and colleagues. The spectacle featured musicians, singers, storytellers, comedians, poets, and jugglers — who knew that astronomers could be so talented in such down-to-Earth pursuits?! On Tuesday some 150 local middle- and high-school students dropped by to hear a special presentation from NASA official Paul Hertz and to tour the exhibit hall and participate in hands-on science-education activities. AAS photo © 2014 Joson Images.